First off, let me throw this out there, I am not a financial adviser nor should anyone take this as advice. This is the current state of my choices in financing a primary home. When my wife and I started down the path of home-ownership in 2006 we had few options, limited by our financial means and very much in the hands of our mortgage broker. We were a single income family with a little bit in savings, moving out of a trailer that I lost money selling ($16,000 loss as I recall). We were purchasing during the housing bubble, so prices were high but countered by the loose lending practices of the day. We did not have 20% to put down and had a number we didn’t want our mortgage payment to go over (I say want but I’m pretty sure debt to income played a large part in that “decision”). We squeaked in just where we thought we should be, slightly over leveraged, but the housing market only goes up, right! “Buy a little more than you can afford” was the mantra of the times. This is a whole other story that I think I have told in the past, but this was our situation. When we purchased our next home in 2012, we were in a slightly better situation, a few more options financially and could squeak into our next home using an FHA with less than 20% down. Slightly more comfortable with the housing market and buying our dream home was worth the stretch. We did not go through financial hardship to acquire this home, nor did the market crash months after purchase. As a matter of fact, we may have purchased at just the right time, before the market craziness we are in now. Fast forward to 2018 (I’m seeing a pattern here, every 6 years we move, pretty close to the average of 7 years, but I digress). Again, moving into our dream home, just like the last two, but in a slightly better position financially and with a bit more knowledge on our side. We are purchasing off market from friends looking to downsize. We are alleviating them of the burden of listing a non-typical property, as similar properties are in the +365 “days on market”. We are learning why properties similar to theirs are on the market for so long, financing is tricky. Cue the bulldog! Diana, no similarities in aesthetics but she is ferocious (in a good way)! A few lenders made the mistake of telling her it couldn’t be done, or it had to be done like x. With financials in hand, she set out to disprove the advice given to her by professionals. Keep on telling her it cannot be done, then sit back and watch it get done. Ok, back to the story. With financials in order, taxes done, and numbers nearly set in stone, we (the royal we) set out to find a lender, or two, or more (as of the writing of this we are deep in talks with two). (parenthetical notes, I still like dealing with private lenders as they are a lot more, more knowledgeable and less restricted when figuring out real life numbers) Again, I digress, as I do from time to time. Conventional financing, I thought we couldn’t do that? Well one company says we can, so far we (again the royal we, thank you Diana) have called credit unions, large national mortgage companies, banks and specialized farm lenders and have a bank and the farm lender talking to us. The farm lender is pretty tied to one strategy, they offer a loan with x amount down and a rate of x. The conventional lender on the other hand, we have choices. So, do I want to put down 10% and use my equity to keep investing in real estate? Or do I want to put 20% and invest less? Do I want the comfort of knowing that there is a 20% barrier between what I owe and what the home is worth? Will 20% really help with a hard to sell property? Do I want to put less than 10% down? Can I add value to the property in time and refinance it later making this a mute point (that’s what we did with our current home). *Just for the record, I don’t mind equity in my rentals as I like the padding for market fluctuations. 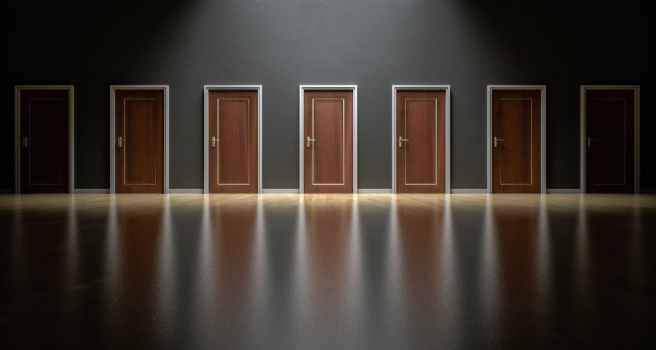 Choices are freedom, and I’m glad that we have made it to a point where we take the responsibility of determining how we want to do things and the possible consequences. Choices in financing our new primary.